Though a violent boating accident almost killed him, Malibu native Chris Goldblatt still loves the ocean. And he’s got an idea that’s just so crazy it could work. Malibu-based ocean conservationist instructs two young inquirers about how and why his reef balls could save the Pacific Ocean. (Photo: Courtesy of Chris Goldblatt)On a moonless night in November 2003, fishermen Chris Goldblatt was awakened by a grinding, sickening crack—the speedboat on which he was asleep was being crushed by a 300-foot petroleum barge.“After I screamed ‘abandon ship’ and jumped off the boat, ping-ponging off the barge that took a big chunk of flesh out of my leg, I remember just screaming and bleeding, convinced I was all alone, pure rage keeping me alive,” says Goldblatt, nearly a decade later from his home in Santa Barbara, CaliforniaHis lifelong love affair with the sea, a place Goldbatt calls “my church,” has compelled him through a variety of marine-related professions. Deck hand. Captain. Sustainable seafood promoter. Marine Protected Area (MPA) fighter and champion. And now reef builder extraordinaire along the Southern California coast. 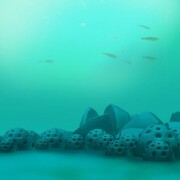 Goldblatt’s current passion are reef balls—think cement igloos—dropped onto the sea floor, which encourage marine life to come back to polluted or overfished areas. He and partners operate three reef projects off the shores of Santa Barbara, Malibu and San Diego. Recently, I caught up with Goldblatt for a wide-ranging interview on all things ocean. TakePart: How did you survive getting run down by a barge at night? Chris Goldblatt: The guy captaining the boat had run into the chain between a tug and the barge, clothespinning the sport boat. After we all jumped off, it came free of the chain just after and split into two like driftwood. Eventually everyone else surfaced around me. I heard a hissing noise and it was the bow of the boat, sinking. There was an escape pod on the boat, all tangled up in the bow lines, which we managed to cut free just before the sinking boat pulled it down. We all managed to get into the lifeboat, and then we drifted through the night towards the Mexican border. Finally a U.S. Border Patrol boat saw our flares and pulled alongside. They didn’t ask if we were okay; they just wanted to know our nationalities. TakePart: For the past decade you’ve devoted yourself to helping to improve fisheries in your own back yard, which hasn’t always been easy. Fights over Marine Protected Areas along California’s coast, which often exclude fishing, pitted preservationists against fishermen. But now you seem to have found a project that makes both sides happy? Chris Goldblatt: Divisiveness is a big problem, where hugely entrenched camps of people become bitter enemies over trying to decide what is the best way forward as far as ocean conservation goes. I’ve traveled around the world looking at how different fisheries deal with these issues, trying to come up with what can be done globally and locally that could unite people on all sides of the question and produce fast, tangible, measurable results that no one can argue with. 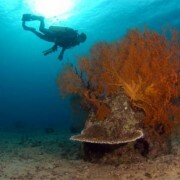 The answer is making thoughtfully designed, well-placed marine life enhancer reefs (using reef balls). I’ve been diving artificial reefs since I was 12 and I don’t like the word artificial, which reminds me of ugly reefs made during the ’70s out of tires and junk and before that by trolley cars and, just off my home in Paradise Bay, out of Studebaker cars. TakePart: Your Fish Reef Project appears to be working, where some of those early experiments did not. Chris Goldblatt: We’ve put down three reefs on the sea floor and they are growing like the world’s greatest Chia pets! Patented by the Reef Ball Foundation of Sarasota, Florida, the reef ball looks like an underwater igloo, full of holes—they come in six different sizes from 300 to 6,000 pounds. The reef balls are made out of a Ph neutral cement and hold about six times the amount of marine life as a boulder the same size. 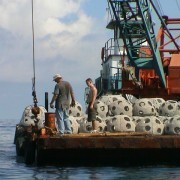 The reef balls are put down on a hard-packed bottom in less than 60 feet of water and the phytoplankton, which is drifting along, settle on it and grows. We’re not trying to change or manipulate nature, just enhance it. Ours reefs are in three locations, in depths of 40 to 45 feet off Santa Barbara, San Diego and Malibu, within arms reach of most people in California and the big ocean institutions like Scripps and University of California at Santa Barbara. Reef balls have been successful off North Carolina, South Carolina, Florida and Alabama, but ours are the first to meet the state of California’s guidelines, which are essentially about mimicking the natural sea floor and then monitoring it for five years. We actually lease the sea floor and the permitting process is lengthy and difficult, which is why no one has done this before us. We had to get the approval of many agencies including the Coast Guard, NOAA, the Coastal Commission, the Army Corps of Engineers and the individual city governments. Ironically, some of the people who were in favor of the MPLA off Malibu, which I fought because it excluded fishermen from the process, are now some of our strongest supporters, because they can see the benefits, which are measurable, not something you have to guess at or hope for. This is going to be our great legacy after we’re gone. And we are selling naming rights to the reefs. You could give $1 million to a park, for example, but that park may not be there forever. Even if there’s a nuclear war and the cockroaches take over the planet, these reefs will always be there, on charts, on dive tour guides; they are real legacy builders. For $10,000 we’ll put a brass plaque on a reef ball.